Revisiting: Comments as a New Agora? Every third Saturday of the month I intend to re-post something I wrote for one of my assorted old blogs or tumblogs to help readers get to know me better. This month I am posting “Comments as a New Agora?” from Learning to Read the Internet, in which I think about the technical constraints on using comments for public dialogue. Of course there are other factors involved, including issues of human psychology and of public education, but I felt somewhat capable talking about technical affordances. Biographical information mentioned in this post may be out of date. Comments as a New Agora? Here’s an idea: on social media, librarians could provide opportunities for conversations rather than take part in them. 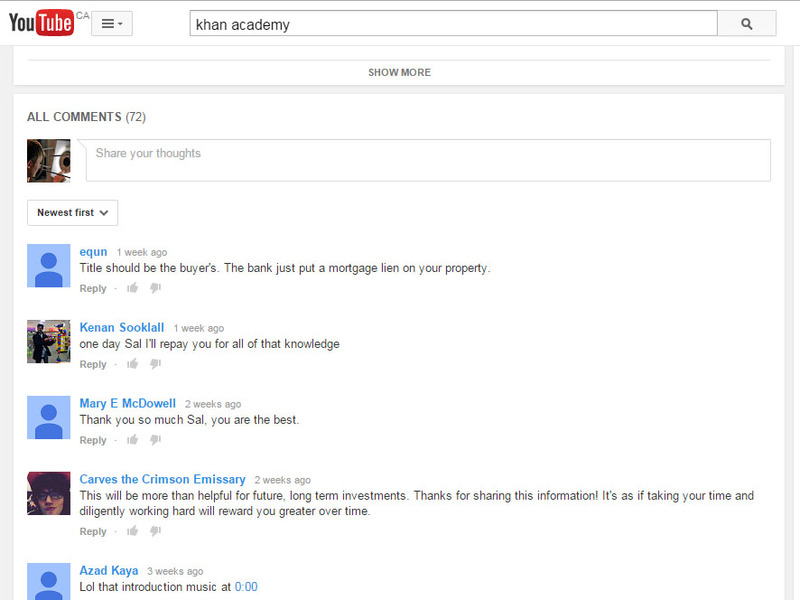 Screenshot of a Khan Academy YouTube video comments section. As I mentioned in my CV, I am studying YouTube comments as a research assistant to Eric Meyers. One thing I’ve learned is that YouTube’s comments space does not have many affordances: it lacks easy navigation, it has fewer sorting options, and so on. For this reason, it can be difficult to have a conversation in the YouTube comments. This is something Eric found in his research before I came aboard: there isn’t much discussion in the comments, and what discussion there is tends to be an entrenched argument between two participants. There aren’t many rich conversations. Fortunately, in this regard, there are ways to get around this problem. Enter Mike Rugnetta and PBS Idea Channel. A .gif of an Idea Channel video. Click it to see the full cycle if it is not already playing for you. On Idea Channel, a PBS-sponsored YouTube channel, Mike Rugnetta has an interesting video format. This video on Internet dialects (I chose it because it relates to this course) has a pretty conventional format, so if you want to skip reading my description you can just watch it. At any rate, he begins each video by introducing an idea about popular culture that he’d like to consider: “Here’s an idea: the Internet has dialects.” Then, after the intro clip, he (usually) argues for this idea for some length of time; he always ends this section by asking people to discuss the week’s idea in the comments. In the second major section, Rugnetta talks about the comments users left on last week’s video. He goes through all of the comments and picks perhaps a dozen of them to discuss; if they were in conversation with one another, he’ll note that, and if they weren’t he might put them in conversation with each other (“I understand what you’re saying, jack01antern, but I think I agree with emily27, who says that we don’t need to think of the panopticon as governed by a central authority, even if Foucault did…”). Rugnetta does take some risks with the positions he argues, and has changed his mind on the issue or acknowledged that he needs to rethink something in response to the comments. Rugnetta cares less about convincing people of his ideas, I think, and more about fostering a conversation about popular culture. He spends a lot of his video encouraging discussion, and brings that discussion up into the video proper for all those who don’t read the comments. He has also created a video series discussing logical fallacies with the express purpose of making online arguments better. So he not only provides content, but also provides an opportunity for a conversation. Libraries as Agora, Comments as Agora? Perhaps the idea is romantic, but is there not a sense in which libraries do not just provide access to information, but help support public discourse? Perhaps a way of avoiding content-creation which might put the library in a perilous position, as some of us have worried about, libraries could instead create opportunities for conversations? (This might also be a way of addressing my previous concern.) Maybe we could or should figure out how best to nurture a culture of civil public discourse? That has its own tasks, of course—comment moderation, encouraging participation, etc. And certainly it would have to fit into the library’s existing mandate and role. But it might be something to think about. And it might be worth thinking about how, and whether, to overcome and work around social media’s affordances and embedded values. I plan to spend some time talking about embedded values—unless Dean has it worked into the course content for a future week already—but in the meantime you could read the related paragraph in this document. I could talk for a while about Disqus; it allows you to follow other commenters, even when they comment on far-flung blogs and sites, which means that you can have Disqus followers following you across media platforms. It also means that people can identify and follow people whose opinions they value, so in a way Disqus can create experts and a system of reputation. But by the same token it allows a higher degree of stalker behaviour and persistent harassment. I think there’s a lot to say on this. That’s not the only way he gets more out of YouTube’s affordances than they seem to offer. He also made a playlist-essay so he could include the music videos better than usually allowed. Although Rugnetta has not used it in this way, I can imagine the playlist-essay might be a way of recovering the back-and-forth discussions that the Response Video feature afforded before YouTube got rid of it. I think Rugnetta is a guy to watch to see what you can do with YouTube; he’s got ideas. As a post script I will add that Mike Rugnetta no longer formats comment responses in this way; he now creates a separate comment responses video. I have also learned that other PBS channels, like Game/Show, have also used the format I attribute to Rugnetta. I do not know who started using it first. This entry was tagged new media. Bookmark the permalink.